Notes: This is, of course, not the first time the Muppet characters have tackled A Christmas Carol, but sadly the Muppet Show Muppets and the Sesame Street Muppets are so far removed from one another these days that it almost doesn’t even matter. At any rate, this (much toned down) version of the Dickens story casts Oscar the Grouch as the most natural Scrooge since McDuck. New characters – all computer animated rather than traditional puppets – appear as the three ghosts. My favorite bit of this, though, is that the special uses footage from classic Sesame Street Christmas shows, thus allowing us to see performances from the likes of the late Jim Henson and Will Lee and the mostly-retired Frank Oz, all right alongside the modern cast of the show. It hardly seems necessary to critique Caroll Spinney as Oscar the Grouch – he’s played the character for over four decades and he’s made him one of the most enduring childhood icons in the history of the world. Let’s instead just agree that Oscar as Scrooge is such an obvious idea that one wonders why they didn’t try it before and move on, shall we? Rickey Boyd provides the voice for the first “ghost” – Rhubarb, the Grouch of Christmas Past. Rhubarb and Oscar agree to watch the old films of previous Christmases, even as they agree not to enjoy them, and we see the “Gift of the Magi” segment from 1978’s Christmas Eve on Sesame Street, which I wrote about last year. It’s a clever use of the old footage, something very few other versions of A Christmas Carol could even imagine, but it does raise an important question: what’s the point of all this? There hasn’t been any talk of “redeeming” Oscar the way Scrooge usually needs to be redeemed, and even if there was, this clip doesn’t even include him. Why is Rhubarb being sent to show Oscar heartwarming clips? Even Oscar asks this question, and Rhubarb doesn’t have an answer. But you know what? It’s Jim Henson, Frank Oz and Will Lee, all together. I’m not about to complain about that. In the next segment, we have an old musical number with Big Bird (Spinney again) singing about how he misses his best friend, Mr. Snuffleupagus, who’s away for Christmas. It’s a cute song, one I don’t really remember, which probably suggests this clip came some time after I grew out of the prime Sesame Street demographic. There’s not really anything to hint as to just when it was made. Once it was over, we cut back to Rhubarb and Oscar, laughing about how bad the clips are. Call me a racist, but this is the kind of typical Grouch behavior that has caused people to have certain opinions about them for decades. Marley returns with the next Ghost-O-Gram. 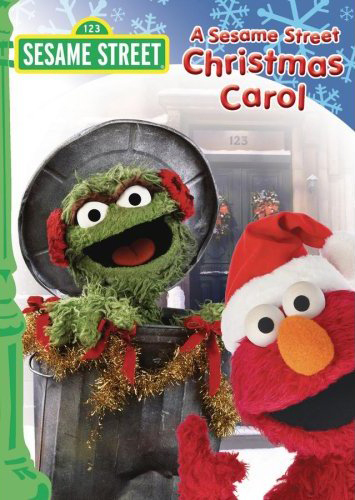 This time Oscar gets a jack-in-the-box that releases Christmas Carol (Kristin Chenoweth), a woman in a Christmas tree outfit, who decides to dress up Oscar’s trash can with a little holiday makeover. It gets worse for Oscar when she pops a Santa Claus hat and beard on him. Carol presents a contemporary segment featuring Sesame Street’s current cash cow, Elmo (Kevin Clash), on a visit to Santa’s workshop. Santa sings Elmo a song which can be summarized as, “Boy, it’s nice that you’re not a selfish jerk,” and we then spin off into another clip. This time, Elmo has somehow caused it to be Christmas every day, because he’s never seen a Christmas special before, and he sings a song explaining that Christmas is only special because it’s once a year. Oscar sarcastically quips, “Christmas every day is a bad idea,” as if he didn’t know that already. For once, Oscar, I’m with you. Then, to ensure that Sesame Workshop maintained its educational grant, we get a couple of Muppet-free segments about Hanukkah and Kwanzaa. The last Ghost-O-Gram introduces us to a flying robot named i-SAM (Kevin Clash), who is there to show Oscar Christmas Future. Instead of a Sesame Street clip, though, we get an animated segment in which we “tour” a future where homes decorate themselves, giant holiday dinners are reduced to pills, and families are whisked around in oversized Christmas tree ornaments. It’s a silly, charming little cartoon that fulfills the “Future” requirement in a decidedly non-frightening way. Oscar suddenly wakes up and sees it’s Christmas morning, and he’s being visited by Joe Marley again – only this time he claims to be “Little Joey Dickens from Brooklyn,” who tells Oscar all he had was a bad dream. He gives Oscar a present, though – a sticky ball of used wrapping paper – and all seems well. Especially since tomorrow is the best time of the year for a Grouch – the longest possible time until it’s Christmas again. I don’t usually like stories that end with the “it was all a dream” conceit, but in a way it’s the only thing that makes sense here. There’s no real reason for Oscar to be visited by these ghosts, nothing changes, nothing actually happens in this film. It’s just an excuse to use a classic framing device to show old clips of the show. It’s not the worst premise in the world, but it feels like there could have been more than a little lip service given to Dickens in the framework. It’s cute, and it’s perfectly acceptable as a Sesame Street special, but remembering just how special some of those specials have been, it seems it could have been better.